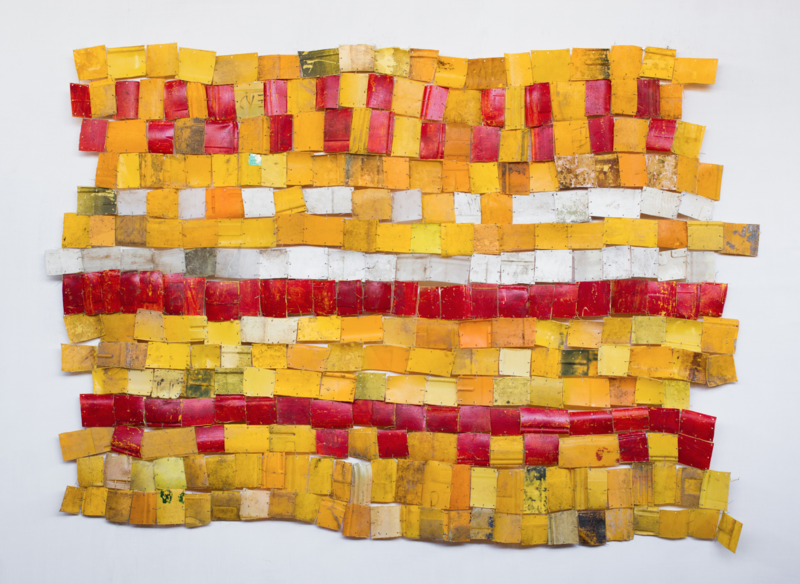 Ever Gold [Projects] is pleased to present Hand to Mouth, a solo exhibition by Ghanaian artist Serge Attukwei Clottey and his US West Coast debut. The exhibition focuses on works created with the surplus of leftover plastic water jugs or “Kufuor gallons” currently causing an environmental catastrophe in the artist’s home country. Reconfiguring the gallon containers as components in paintings and sculptures, Attukwei examines the migration of these objects and how they can serve as both cultural relics and symbols of consumption and waste. Works from Attukwei’s Kufuor Gallons and Common Man series will be on view, in addition to freestanding wood and plastic sculptures from his Uncolonized Portraits series and an ongoing screening of his film The Displaced. 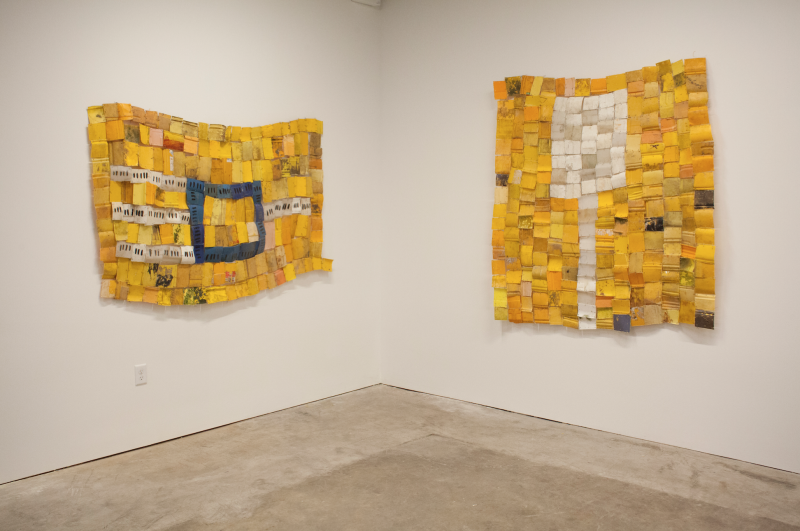 This is the first show for Ever Gold [Projects] in its new exhibition space at Minnesota Street Project and will be on view March 18 through April 30, 2016. An opening reception will be held Friday, March 18 from 6-9:30 pm, with the artist in attendance. 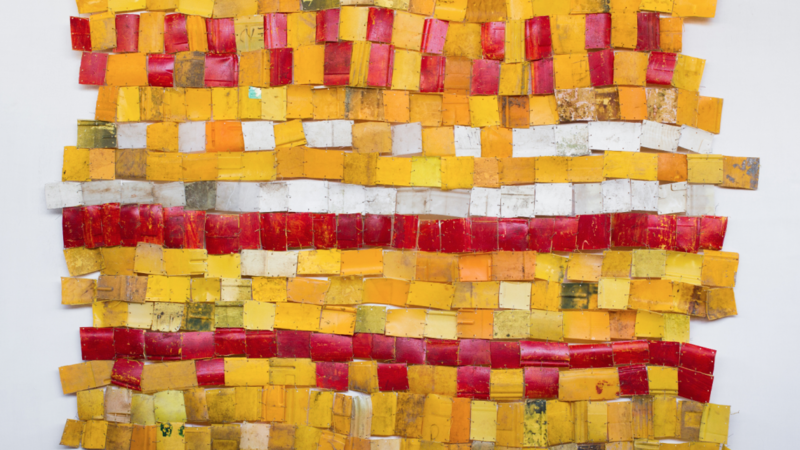 Applying traditional Ghanaian folk aesthetics to his compositions with the collected gallons, Attukwei “makes paintings without paint.” Cutting the gallons into small pieces, the artist shapes the plastic over an open flame—a process similar to the action of bronze sculpting. Binding the multicolored plastic sections together with copper, he combines the ever-present plastic waste with one of the most valuable commodities in the Ghanaian market. His mixed media paintings and sculptural works also incorporate locally sourced textiles, salvaged electronic gadgets, and found wood, bones, and shells. The exhibition will contain 10 large-scale works from the series Kufuor Gallons. 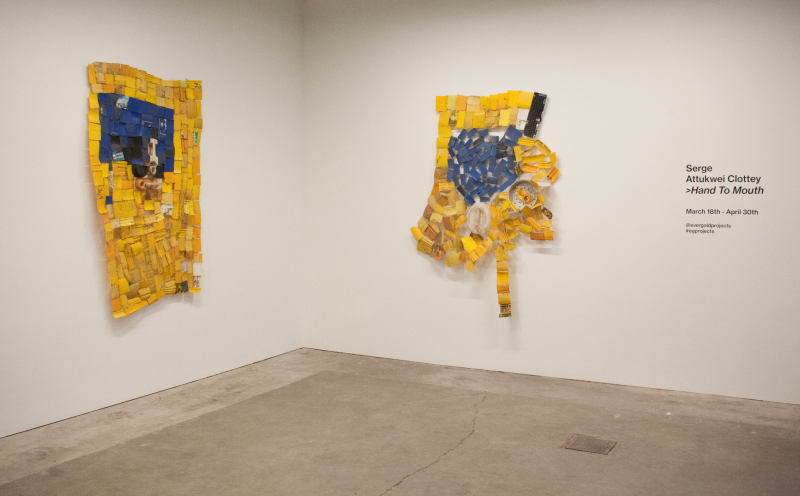 Also on view is a selection of smaller works from Attukwei’s Common Man series, in which Attukwei isolates the tops of the gallon containers, which resemble traditional Afrian masks, against backgrounds of traditional local textiles. Accompanying the paintings and sculptures in the exhibition is an ongoing screening of The Displaced, an 11 minute film documenting a performance by Attukwei and his performance collective, GoLokal, in which Attukwei embarks on a symbolic journey in remembrance of his ancestral migration from Bukom to Labadi aboard a canoe in the ocean. As an integral part of his practice, Attukwei utilizes solo and group performances as a means to provoke dialogue and promote community development, with some embarking into political protest. 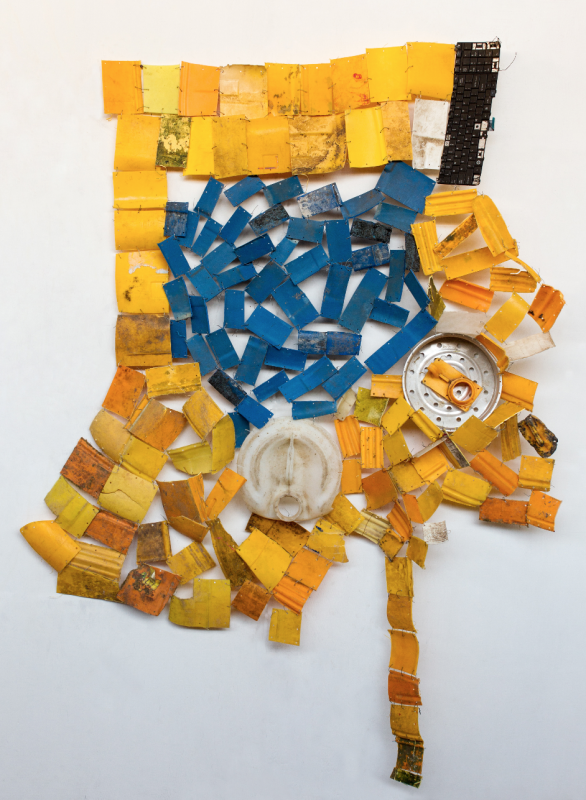 Serge Attukwei Clottey (b. 1985, Accra, Ghana) lives and works in Accra, Ghana. Clottey attended the Ghanatta College of Art and Design in Ghana before studying at the Escola Guinard University of Art in Brazil and has completed multiple fellowships abroad. He currently works in a variety of media including performance, photography, video, painting, drawing, and sculpture. 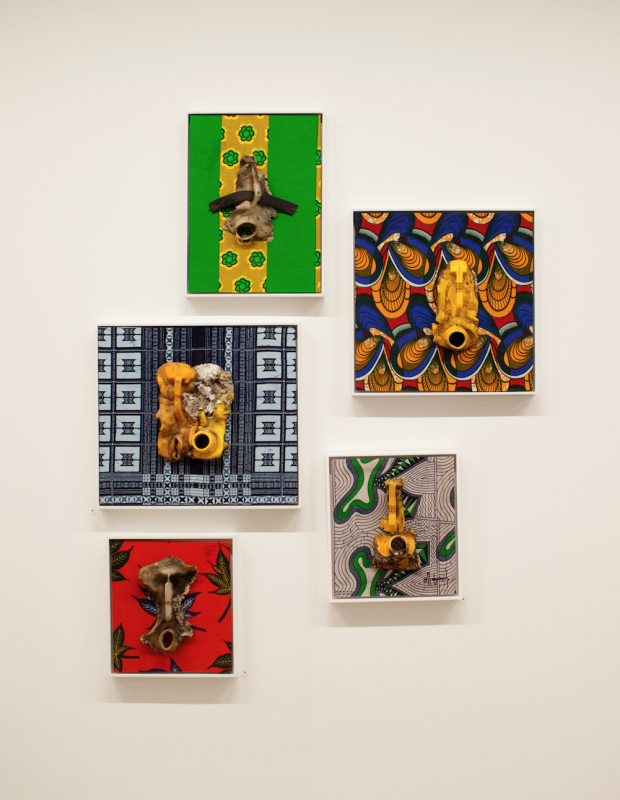 Recent exhibitions include Gold Standard at Ever Gold [Projects] (San Francisco, 2019); Defying the Narrative: Contemporary Art from West and Southern Africa at Ever Gold [Projects] (San Francisco, 2018); Everyday Myth: Survival and Sustenance at Ever Gold [Projects] (San Francisco, 2018); Differences between at Jane Lombard Gallery (New York, 2018); The Displaced at Gallery 1957 at Lawrie Shabibi Gallery (Dubai, 2018); Hand to Mouth at Ever Gold [Projects] (San Francisco, 2016); My Mother's Wardrobe at Gallery 1957 (Ghana, 2016); Earthly Conversations at GNYP Gallery (Berlin, 2016); The Displaced at Feuer/Mesler (New York, 2015), We Don't Contemporary at Kampnagel Hamburg (Hamburg, 2015); The Silence of Ordinary Things at The Mistake Room (Los Angeles, 2015); Du Bois In Our Time II at the University Museum of Contemporary Art (Amherst, MA, 2014); and Cultures in Confluence at the Goethe-Institut Ghana (Accra, 2011). His work is in the collection of the Nerman Museum of Contemporary Art (Overland Park, Kansas), the Museum of African Contemporary Art Al Maaden (Marrakech, Morocco), the Nubuke Foundation (Accra, Ghana), the Seth Dei Foundation (Accra, Ghana), Modern Forms (UK), and The World Bank Collection (Washington D.C.), as well as a number of international private collections. 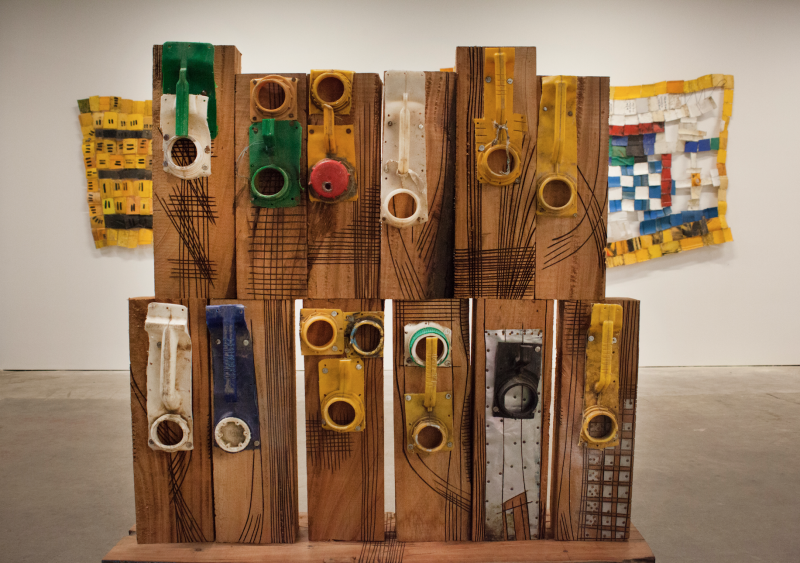 Serge Attukwei Clottey, “American Lottery”, 2015. Plastic, wire and oil paint. 51 x 94 inches. 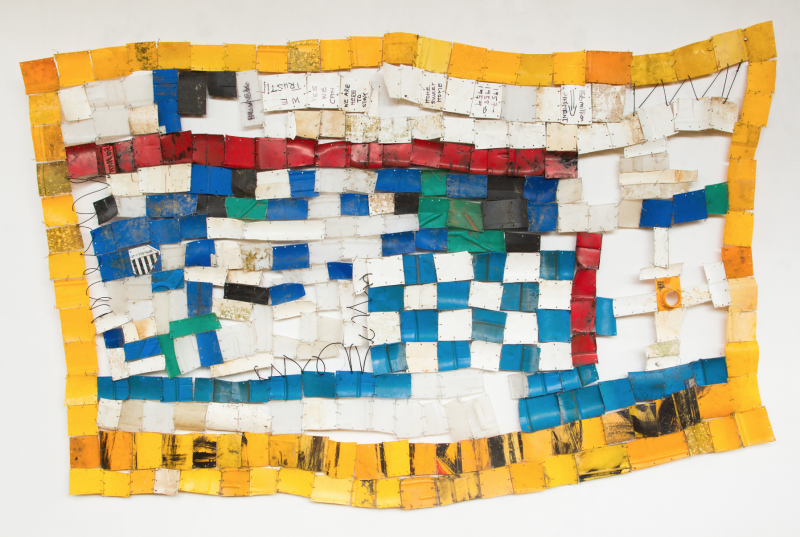 Serge Attukwei Clottey’s plastic tapestries bring to light one of the paradoxes of environmental intervention: creating a new problem while attempting to fix an old one. To address the drought in Clottey’s native Ghana in the early 2000s, then-president John Kufuor had water dispersed across the country in brightly colored jugs that came to be known as Kufuor gallons. Since discarded, thousands of these plastic containers now pollute the Ghanaian landscape and serve as the artist’s primary sculptural material. 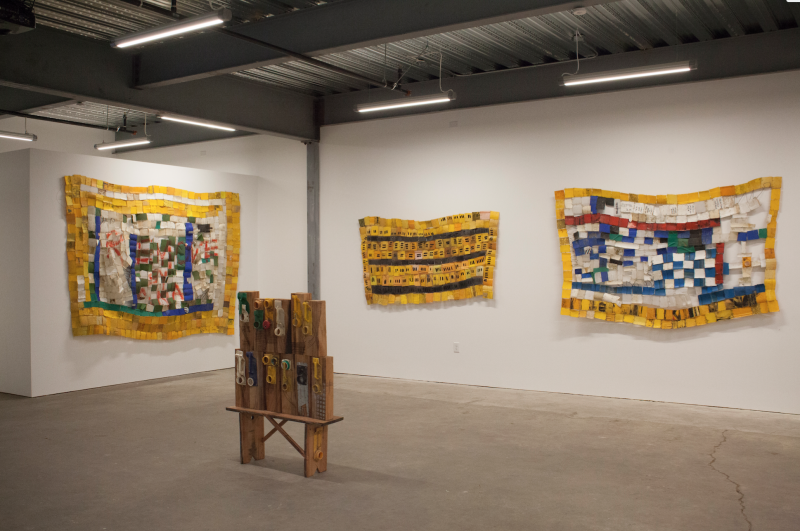 After cutting the jugs into rectangles and arranging the pieces into a kind of patchwork quilt threaded with wire, the artist draws on Ghanaian folk aesthetics for his compositions—floating simple white, red, and blue shapes in a mostly yellow field. With ten of these works on view here, their similarities are broken up only by marks in paint or ink on the surface of some. In American Lottery, 2015, scrawled phrases such as “We Trust” and “Yes We Can” provide a social dimension to these mostly abstract works. Simultaneously optimistic, and ironic, with these words, Clottey underscores the complicated symbiotic relationship between people and their environment. The artist amplifies this political message with works from his series “Common Man,” 2014–16. For these, he has taken the tops from the plastic containers and mounted them on supports made from traditional Ghanaian textiles. With the handle of each flask now resembling a nose and the spout a mouth, the objects read as portraits, or African masks. Some of the mouths are distorted, gaping holes that, when paired with a lack of eyes and the roughed up surface of the plastic, convey anguish and suffering. In this way, these works become totems of both salvation and devastation.